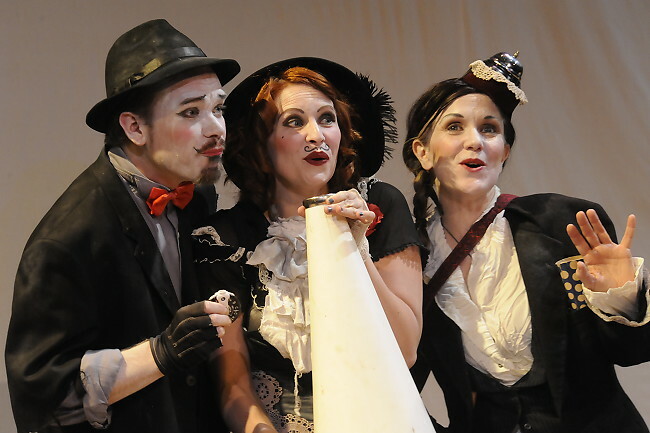 Meridith Grundei, Jason Maxwell, and Amanda Berg-Wilson of Boulder-based theatre company The Catamounts were kind enough to take a break from rehearsal to answer our questions about their work. The Catamounts is gearing up to open their Regional Premiere of Mickle Maher's There is a Happiness That Morning Is this week at The Dairy Center for the Arts. The production runs March 7-22, with a special performance on March 30 for Boulder Arts Week. We call what we do: Theatre for the Adventurous Palate. Meridith: I loved Paul Fowler's music in square product theatre's adaptation of Ginsberg's Howl. This stands out for me. Jason: Its hard to beat a lot of great FEED moments on the 63rd St. Farm, but my favorite came during a rehearsal for Fermentation. It was after a sudden weather change and the wind picked up right during an epic monologue from Ryan Wuestewald, and I am lying in the grass watching him and a flock of birds floats by being carried by the wind while he played it spectacularly. I wish there was an audience that day. Amanda: I saw Paper Bird up at the Jamestown Mercantile one night. It was relatively early in my move back, and I was like: watching this amazing, arty Americana band in an old mercantile in a little mountain town? This the best version of my life here I could imagine. (I realize Jamestown is Boulder County. Oh well.) I also had a couple of margaritas at the Rio one night, and then immediately went to the Wesley Chapel to see square product theatre’s Songs of Meat & Cake. I sat in the front row by myself, buzzed, and got served chocolate cake and a bunch of weird songs. Awesome. I also loved the very first Truth Be Told Story Slam I attended. I’m a sucker now for the power of a short, well-told personal story. And I’d be disingenuous if I didn’t mention how much I love our FEED events, or our shows with community meals. Some of my fave nights of the year. Full of great art, booze, food, and folks. Meridith: I would love to collaborate with visual artist, Angela Beloian. I would love to see how she brings a set to life. Her dynamic use of shape, color and simplicity is exciting to me. Amanda: We’ve had several awesome composers work with The Catamounts before: Paul Fowler, Gary Grundei, Kevin Packard, and Nina Rolle, but I’d work with all of them again and again. Someone I don’t know at all but whose work I love: singer-songwriter Ben Hanna. Jason: I would say I would LOVE to collaborate with Nina Rolle again, working with her on Failure: A Love Story was tons of fun and I think I could learn a lot about being a "musical actor" from her. Oh and I would love to put me, Zac and Lauren Shepard-Wilkinson, and someone from Boulder who specializes in the marijuana culinary arts in the same room together. We’ve added a performance of our regional premiere production of There Is A Happiness That Morning Is by Mickle Maher, Sunday, March 30th in the East Theatre at the Dairy. The show is at 7pm, but it will be preceded by a reception with The Catamounts where we’ll serve light appetizers and the beer created for the show by Wild Woods Brewery. The show itself is a fast, funny romp about two college professors who are lecturers on William Blake, and who were caught in flagrante delicto the night before, and must apologize in class or lose their jobs. Aaaand the whole thing is in verse. It’s a great show, and will be especially great with a delicious beer. We’ll be conducting arts education programs at Heatherwood Elementary and another school in April and May, sending Catamount artists to work with the students on creating and performing their own original, multi-disciplinary performance vignettes. In June, we’ll have our last FEED event of our 2013-14 season, FEED: Mountain (FEED is our program where we pair performance with artisanal food and drink in a four-course, seated dinner.) Then, we’ll be gearing up for our most ambitious season yet--to be announced at our fundraiser at the beginning of May!